US memory specialist Transcend has extended its fancy-looking T.sonic MP3 player range with its first colour-screen model. It also sports a cute curvy design with a stand-out swirly pattern on the front. 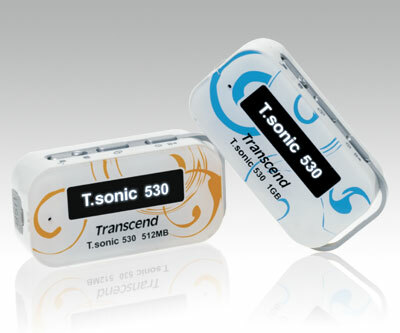 The Flash-based T.sonic 530 is available in 512MB and 1GB versions. Both come with an FM radio and a battery that Transcend claims will provide 15 hours' music playback. There's a voice recorder but the karaoke-style lyrics display mode sounds much more fun. There are six EQ pre-sets and a custom equaliser to help you adjust how your MP3, WMA and/or WAV files sound. The 5.1 x 2.6 x 1.9cm player can double-up as a USB Flash drive, complete with software to lock off part of the player rendering your data accessible only to those who have the magic word.